There is a complete range of flow and fluid shear relationships from any given impeller type. Three types of impellers are commonly used in the low viscosity region, propellers, Fig. 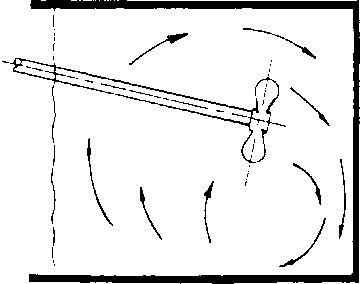 1; turbines, Fig. 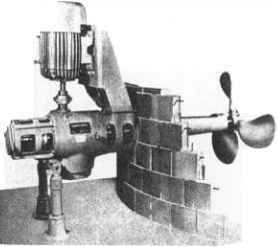 2; and axial flow turbines, Fig. 3. 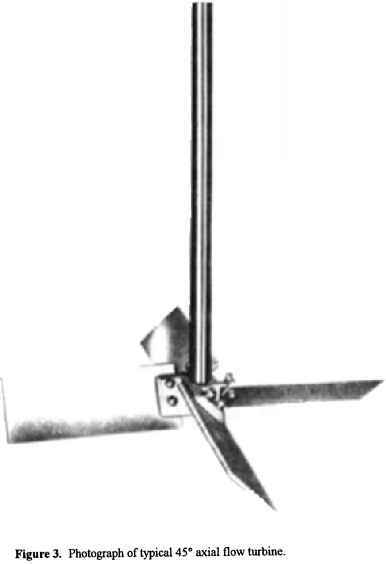 Impellers used on small portable mixers shown in Fig. 4, are often inclined at an angle as well as being off-center to give a good top-to-bottom flow pattern in the system, Fig. 5. Large top-entering drives usually use either the axial flow turbine or the radial flow flat blade turbine. 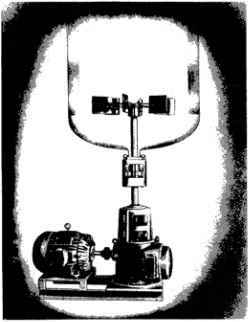 For aerobic fermentation, the radial flow disc turbine is most common and is illustrated in Fig. 6. To complete the picture, there are also bottom-entering drives, shown in Fig. 7, which have the advantage of keeping the mixer off the top of all tanks and required superstructure, but have the disadvantage that if the sealing mechanism fails, the mixer is in a vulnerable location for damage and loss of product by leakage. Figure 8 illustrates side-entering mixers which are used for many types of blending and storage applications. Figure 1. 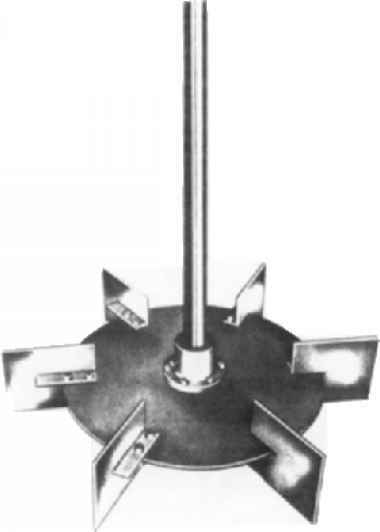 Photograph of square-pitch marine type impeller. Figure 2. 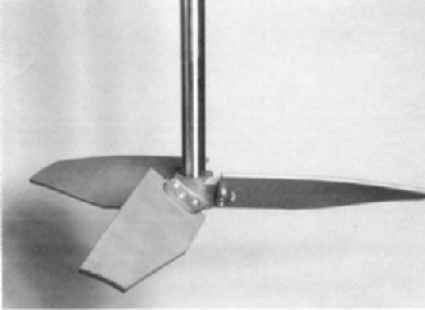 Photograph of radial flow, flat blade, disc turbine. Figure 6. Series 800 top-entering mixer. Figure 7. 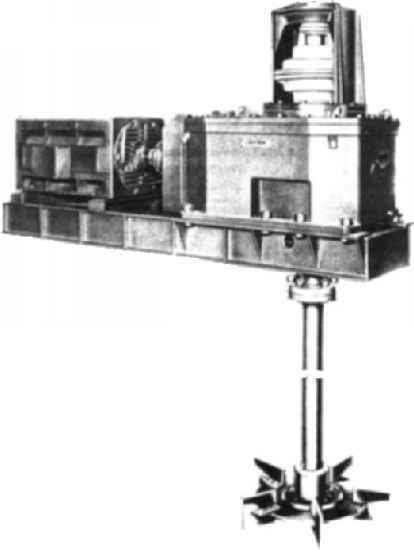 Photograph of bottom-entering mixer. Figure 8. 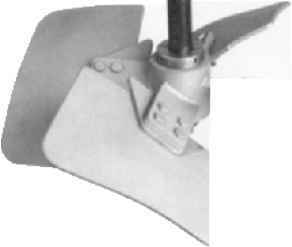 Photograph of side-entering propeller mixer. 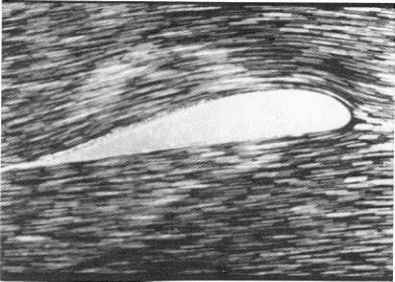 The introduction of fluidfoil impellers, as shown in Fig. 9a through 9f, give a wide variety of mixing conditions suitable for high flow and low fluid shear rates. Fluidfoil impellers use the principles developed in airfoil work in wind tunnels for aircraft. Figure 1 Oa shows what is desirable, which is no form separation of the fluid, and maximum lift and drag coefficients, which is what one is trying to achieve with the fluidfoil impellers. 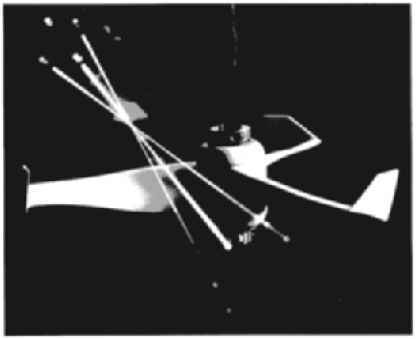 Figure 1 Ob shows what happens when the angle and the shape is such that there is a separation of the fluid from the airfoil body. 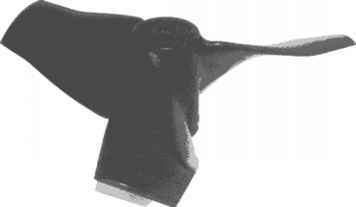 The A310 impeller (Fig. 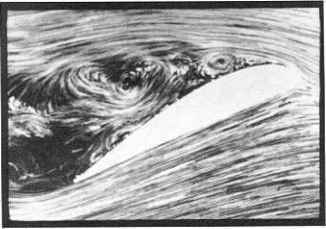 9a) was introduced for primarily low viscosity fluids and, as can be seen, has a very low ratio of total blade surface area compared to an inscribing circle which is shown in Fig. 11. When the fluid viscosities are higher, the A312 impeller is used (shown in Fig. 9b) which is particularly useful in fibrous materials. To give a more responsive action in higher viscosities, the A3 20 is available which works well in the transition area of Reynolds numbers. When gas-liquid processes are used, the A315 (Figure 9d) has a still higher solidity ratio. It is particularly useful in aerobic fermentation processes. Impellers in Figs. 9(a-d) are formed from flat metal stock. To complete the current picture, when composite materials are used, the airfoil can be shaped in any way that is desirable. The A6000 (Fig. 9e) illustrates that particular impeller type. The use of proplets on the end of the blades increases flow about 10% over not having them. An impeller which is able to operate effectively in both the turbulent and transitional Reynolds numbers is the A410 (Fig. 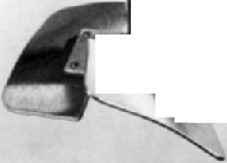 9f) which has a very marked increase in twist angle ofthe blade. This gives it a more effective performance in the higher viscosity fluids encountered in mixers up to about 3 kW. One characteristic of these fluidfoil impellers is that they discharge a stream that is almost completely axial flow and they have a very uniform velocity across the discharge plane of the impeller. However, there is a tendency for these impellers to short-circuit the fluid to a relatively low distance above the impeller. Very careful consideration of the coverage over the impeller is important. If the impeller can be placed one to two impeller diameters off bottom, which means that mixing is not provided at low levels during draw off, these impellers offer an excellent flow pattern as well as considerable economies in shaft design. To look at these impellers in a different way, three impellers have been compared at equal total-pumping capacity. Figure 12 gives the output velocity as a function of time on a strip chart. As can be seen in Fig. 12 the fluidfoil impeller type (A310) has a very low velocity fluctuation and uses much less power than the other two impellers. For the same flow, the A200 impeller has a higher turbulent fluctuation value. TheRlOO impeller has still higher power consumption at the same diameter than the other two impellers, and has a much more intense level of microscale turbulence. The fluidfoil impellers are often called "high efficiency impellers", but that is true only in terms of flow, and makes the assumption that flow is the main measure of mixing results. Flow is one measure, and in at least half of the mixing applications is a good measure of the performance that could be expected in a process. These impellers are low in efficiency in providing shear rates—either of the macro scale or the micro scale. The use of computer generated solutions to problems and computational fluid dynamics is also another approach of comparing impellers and process results. There are software packages available. It is very helpful to have data obtained from a laser velocity meter on the fluid mechanics of the impeller flow and other characteristics to put in the boundary conditions for these computer programs. Figure 9a. A310 fluidfoil impeller. Figure 9c. A320 fluidfoil impeller. Figure 9b. A312 Fluidfoil impeller. Figure 9f. A410 fluidfoil impeller made from composite materials with high twist angle ratio between tip and hub. Figure 10a. 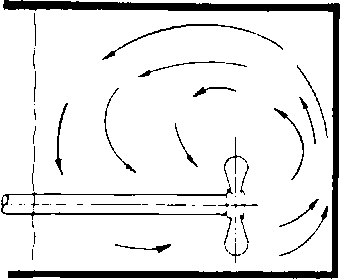 Typical flow around airfoil positioned for maximum lift; minimum drag. 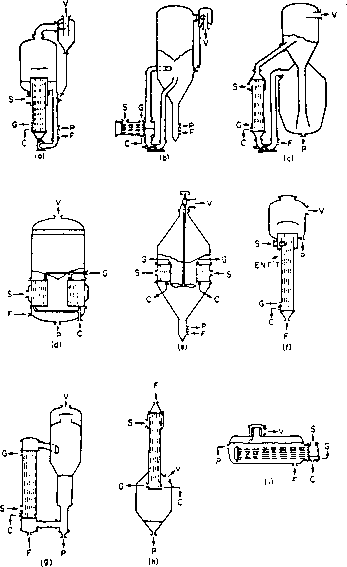 Figure 10b. Typical profile of airfoil at an angle of attack that gives fluids separation from the airfoil surface.